Since he took delivery of his 2011 Chevrolet Volt electric car with extended-range capability in December, Mike DiPisa is averaging 231 miles per gallon of gasoline. It's because his 26-mile daily commute allows him to run almost gas free. "I haven't filled up my Volt since I took delivery," the Lyndhurst, N.J. resident said. Of the 1,485 miles DiPisa put on his Volt, 1,391 have used using grid electricity. DiPisa's fuel economy is on the high end of real-life experiences of early Volt owners, but it isn't that unusual. Matt Stehouwer of Lansing, Mich., says he's getting 62 MPG after putting more than 1,500 miles on his Volt, including a drive from New York, where he took delivery of his car. He commutes about 32 miles daily from his home to his job as Technical Manager at Michigan State University's College of Natural Science. Mike McCarver, a retiree from Los Altos, Calif., has traveled nearly 800 miles since he bought his Volt on Jan. 28, and he's averaging 93 mpg. McCarver uses his Volt to travel around town, to the local country club, and occasionally to his vacation home in Carmel about 80 miles away. Three Volts. Three distinct fuel economy stories. 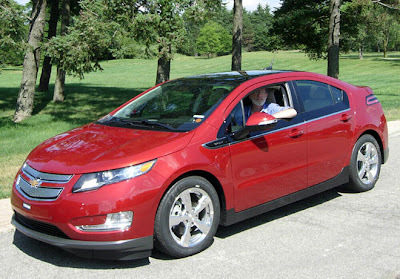 Unlike most cars, where mileage differences vary slightly from driver to driver, the Volt defies conventional MPG measures because it runs approximately 35 miles on a single charge of electricity to its 16 kWh battery, and then can travel another 344 miles on an onboard gasoline-powered electric generator that seamlessly kicks in when the battery is drained. By recharging their Volt regularly, owners are easily surpassing the 93 miles per gallon equivalence, or MPGe, on full electric operation and an overall 60 MPGe composite fuel economy during extended-range operation. The EPA ratings make the Volt the most energy efficient compact car on the market today. "I really believe that over the long-term we have to have technology that is going to get us off fossil fuels and the Volt does that – I have the option of never buying gas again," McCarver said. Said Volt marketing director Cristi Landy: "The Volt is great for any lifestyle and can handle the driving demands of daily life. The majority of Volt customers are finding that by recharging their cars daily they are seeing exceptional real-world fuel economy. "